Daniel Negreanu has one of he most recognizable poker face in the world. As he says himself, he does not have a poker face, but a goofy face. But his face is very well known all over the world, as he is an extremely charismatic player. Not just charismatic, highly successful too. 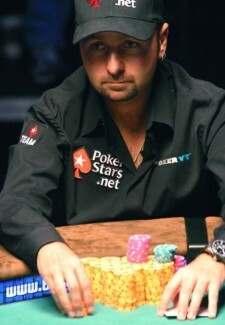 Born in 1974 in Canada, Daniel Negreanu moved to Las Vegas in 1995. He started hustling billiard halls before becoming a regular at Toronto's illegal poker rooms while a teenager. He has been hooked to poker since and has never looked back. Kid Poker as he is nicknamed has four WSOP bracelets under his belt. The $2k Pot Limit Hold'em in 1998, the $5k Omaha Hi/Lo Split in 2002 and the $2k Limit Hold'em both in 2004 & 2008. He also has two WPT titles, the WPT Borgata Poker Open and the WPT Five Diamond World Poker Classic both in 2004. He gained his nickname "Kid Poker" in 1998, as he was at the age of 23 the youngest champion to win a WSOP bracelet. This record has been surpassed since. In 2004 Kid Poker was named player of the year when he won 1 WSOP and 2 WPT titles. The list above just describes his major titles. Daniel Negreanu had numerous money finishes at major events, including 34 at the WSOP and 18 at the WPT. Few people exceed his total tournament earnings, which stand at around 3 million dollars. Negreanu is superbly charismatic. His outgoing personality is one of his secret weapons at the table. This is not an act, but his natural affability makes other players at the table open up, sometimes betraying the strength of their hands. This has often been caught on television. Daniel is a member of the Pokerstars Team and only plays online poker at pokerstars, under the screen name 'KidPoker'. Pokerstars periodically offers VIP tourneys leading to a heads-up match against Daniel. Daniel wrote three poker books; Hold'em Wisdom for all Players, More Hold'em Wisdom and Poker Hold'em Strategy. These easy to read books are full of Daniel's vast poker knowledge. He also contributed one chapter in Doyle Brunson's Super System 2, the one presenting Triple Draw. Daniel Negreanu is somehow the face of poker, making numerous appearances and annoucements, including for the PPA. He has is own poker coaching website, pokervt. Negreanu coined his style of play the "small ball" style. This very loose-aggressive style consists in getting involved with many pots while keeping the bets small. The resulting wild image will generate a lot of action and once in a while one of his big hands will be paid off handsomely. Turn on the television for a poker show and chances are Daniel Negreanu will be there, either at High Stake Poker, Late	Night Poker or a WPT final table replay. Daniel is the voice of PokerStars, the largest online poker room. You can even play against Daniel at the high stakes tables at PokerStars named after him. Use Marketing code PSP8181 when you create your account at PokerStars. This will guarantee you a 100% bonus up to $600 for the first three deposits that you make.